In the first part of our guide, we will focus on different types of longboard decks. When choosing a longboard deck, ask yourself the following essential questions. What type of longboarding do I want to do? Do I want to bomb hills or cruise flats? Do I want to perform tricks such as power slides and dancing? Or do I want to do a lot of carving? One question that is especially important for the beginner longboarders is: How stable do I want to feel? The deck you choose will play a major role in what type of longboarding you will be doing. The length of a longboard is an important characteristic to consider. 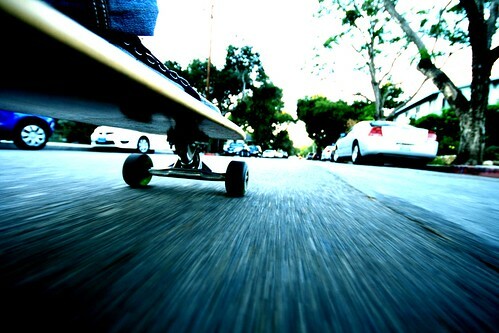 Longboard decks range from 28 inches to more than 65 inches in length! Even though short longboards, such as the 28 inch are not exactly “longboards,” they are good for shorter riders or those who want do skateboard tricks. Medium longboards range from 33 inches to 42 inches and are good for any type of longboarding. With these boards, you should be able to cruise, carve, and dance. Long decks are over 42 inches and are great for cruising around on flat areas and dancing. Longboard length also affects stability. In theory, the longer the board, the more stable you will feel. However, your wheelbase is the biggest factor in making you feel stable. Another feature to consider when choosing the length of your deck is weight. Long decks tend to be heavier. If you are cruising around town or commuting to school, a long deck could be cumbersome. The width of your longboard is not the most important part, but can affect the overall feel of your ride. A wider deck can make you feel more secure by allowing your entire foot to be on the surface. Longboard decks come in concave, flat, or camber shapes. Decks with a concave in the middle lock your feet to the board, and make turning easier because you can feel the heel and toe edge of the deck. Flat decks are great for cruising or relaxed rides. Camber decks bend upward in the center and allow for more bounce. Longboard decks also can be pintail or drop-through, as well as with or without kicktails. Drop-through decks allow for lower center of gravity and great flex. Drop-through decks allow the truck to come completely through the deck. Pintail longboards have pointed noses, but this shape does not affect your riding. Pintail decks have the trucks mounted on the bottom of the board. Longboards with kicktails allow for different types of maneuvers and tricks. The shape of your board is all a matter of preference and riding style. The wheel base is the measurement you get from the front wheels to the back wheels. If you do some research on the deck you are purchasing, each manufacturer should state the wheel base of the deck. The wheel base has a direct correlation with the tightness of your turns. Boards with a longer wheel base will make wider turns than those with a shorter wheel base. A shorter wheel base is needed when bombing hills at high speeds in order to take turns sharply. Longer wheel bases are good for cruising around on the flats. Longboards are made with various degrees of flexibility. Decks made of wood tend to be flexible, and decks made of composite material tend to be stiff. A flexible board can get you lower to the ground, therefore lowering your center of gravity. Flexible boards absorb some of the impact when riding over rough surfaces, and are great for those who like jumping on or off their boards. Stiff longboard decks are good for downhill longboarding. They give more of a sense of control by increasing your leverage and respond well to slides or drifting. Quick tip: Research the flexibility of the board you want to purchase and determine if it will suite your boarding style. Companies offer various degrees of flex depending on your body weight. So research is crucial! As mentioned before, longboard decks come in wood or composite material. Some types of woods can split easier when your longboard hits a curb or other object. Composite material tends to hold up very well to abuse. Do not let this be the sole determining factor of your board choice. Again, do your research on the particular board you are interested in to see if anyone has had problems with their deck splitting on the nose or tail. Nose guards also come on some decks and can be bought separately to help with this issue. When choosing a longboard deck, finding your personal preference and doing the right research will help you find the best longboard! I have a Sector Nine long board, length of 42 inch/ I’m looking for a board that’s good for carving and hopefully getting into sliding. Are pintails good for carving? Yes, pintails are fine for carving. The length of the deck plays more of a role in carving than the deck type. Really, carving is more about your truck setup and tension than anything.